Last week I announced a new series for the summer. Every Tuesday I will share a story or experience from my adventures overseas. I'm kicking it off today with the time I went camping in England. With Rabbits. During the summer solstice. I'd like you to meet my friends. 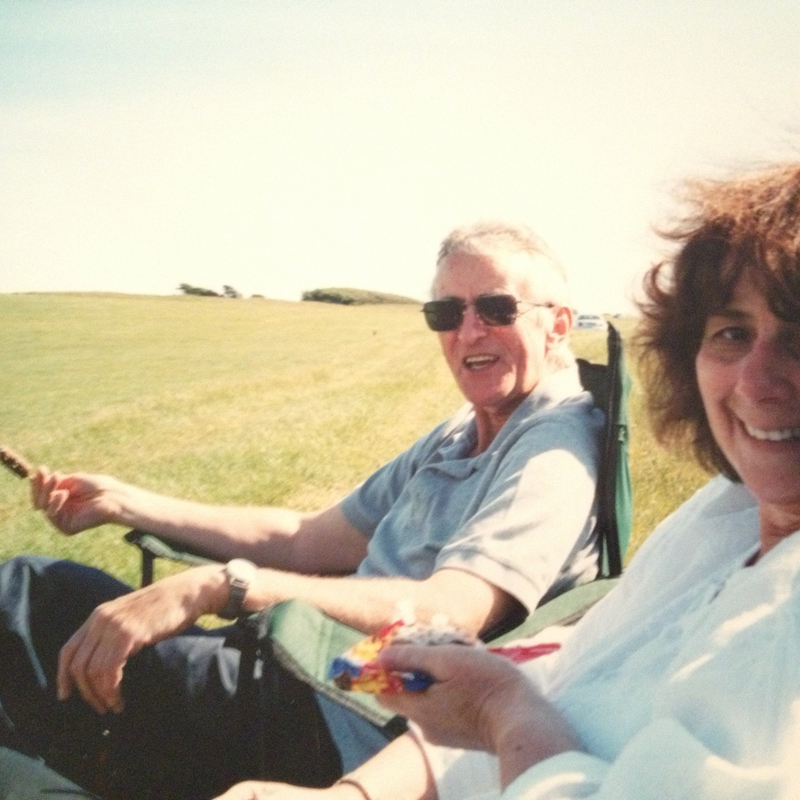 Nick and Carol Pett are on the left. Carol's father, Reginald Beer , is on the right. Yes, I know. I have delightful friends and no, they aren't the rabbits I mentioned earlier. The summer of 2000 was spent living with this family in England. I went on a mission trip to Norfolk and they were my host family. I went back the following year and stayed with them again after a similar trip. Being the adventurer that I am, I scheduled to stay an additional few weeks after my 2001 trip and hang out with this crew. I guess my parents felt that was okay given the age of my UK posse. We loaded up their caravan ( American translation: camper) and headed down to spend seven days camping in Brighton. It was a lovely drive to Brighton which is on the English Channel. I blasted my Whitney Houston's Greatest Hits CD in my discman in the backseat in an effort to tune out the radio broadcast Nick & Carol were listening to. Some BBC program about a financial dilemma. I'm sure it was important, but at 19 I really didn't care. Every so often we would pull over when we saw an ice cream truck and a pretty view. No kidding. Notice the picture above? Ice cream bars being eaten randomly on the side of the road. Maybe that is normal English behavior? Or just my friends? Either way we had to pull over, get out the folding chairs and partake of some dairy goodness. 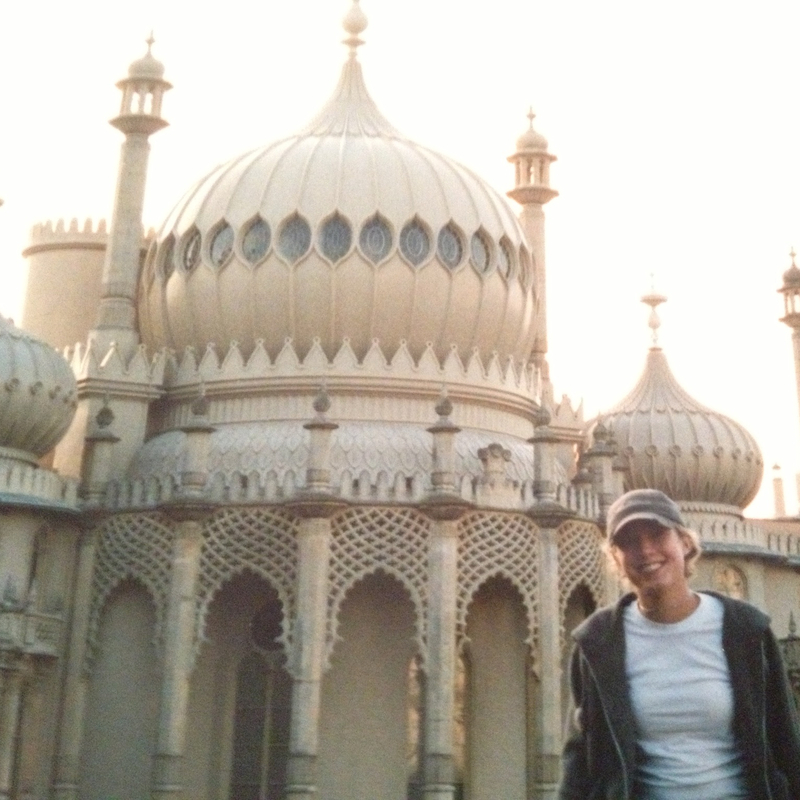 When we got to Brighton it was absolutely beautiful. Here I am in front of one of my favorite buildings there. You may not be able to recognize me with this baseball hat on. This was before the days of dry shampoo, okay? Eventually we arrived at our campsite where we were to spend the next week. It right by the beach, but very quickly we discovered that this was no ordinary week to go camping. The place was flooded with the who's who of bizarre hippie English people. And then there was me. A 19-year-old American who was vacationing with a retired British couple. In a caravan down by the beach. Ahh! 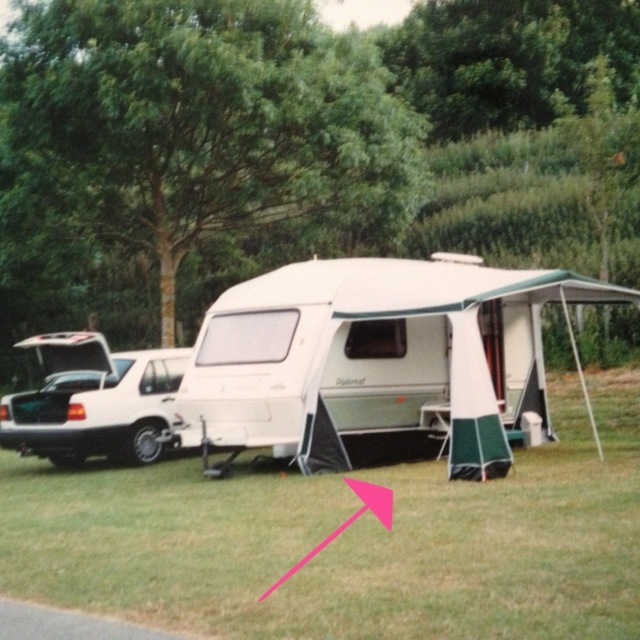 Here is the caravan with an arrow pointing to where I slept all week. Yes. I slept OUTSIDE. Under the awning. In a sleeping bag. 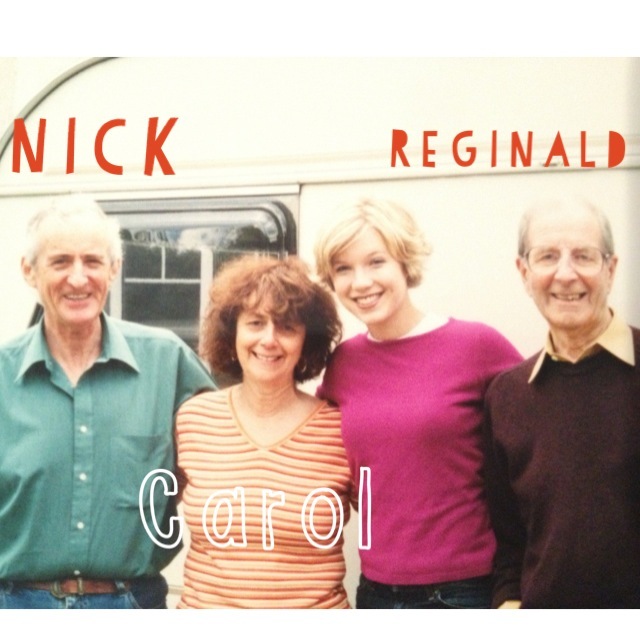 I had assumed that I would be inside the camper with Nick & Carol. But no, twas not to be. Nick handed me a sleeping bag, a pillow and said "See you in the morning!". Grabbing my towel, I headed off down the hill to the campground bathrooms for a shower. The line was nearly out the door with the beach-going new age crowd. Not sure why they were there since it didn't appear that showering was their thing. Eventually I got back to my sleeping bag & crawled in. To my left was the camper where my friends were sleeping tucked in their beds. To my right just a little ways off were some ridiculously strange people and their drums. But there I was. Just me in my little sleeping bag thinking about how bizarre my life is. 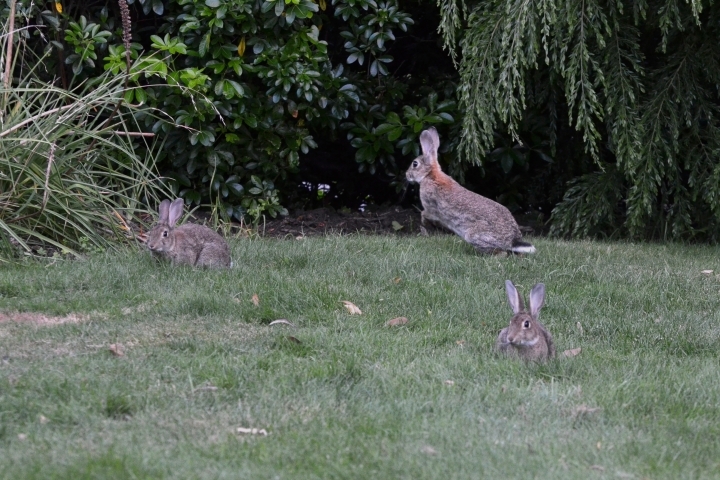 I peeked out from my blanked and saw twenty-something rabbits in the grass around me. Just when I thought it couldn't get any weirder... They stayed there all night. In fact, they came for the whole week we were there. Laying in my sleeping bag, I could hear the soft movement of grass. I would peek out of my blanket and see the rabbits sitting around me. One big fat one liked to sleep about two feet from my head. By the third night I had learned to tune out the mystic drum circles and the fear of being bitten by a wild rabbit. I guess when you are 19 you adapt pretty quickly. A week later I found myself flying home aware that this would make a good story some day. I learned a lot on that trip. I discovered that Whitney Houston is good for drowning out the BBC and drum circles. Rabbits won't bite if you lie very, very still. Most importantly, I learned that I really don't like camping. Anyone else have a camping story to share?? ?